We investigate the large-scale forcing and teleconnections between atmospheric circulation (sea level pressure, SLP), sea surface temperatures (SSTs), precipitation and heat wave events over western Europe using a new dataset of 54 daily maximum temperature time series. Forty four of these time series have been homogenised at the daily timescale to ensure that the presence of inhomogeneities has been minimised. The daily data have been used to create a seasonal index of the number of heat waves. Using canonical correlation analysis (CCA), heat waves over western Europe are shown to be related to anomalous high pressure over Scandinavia and central western Europe. Other forcing factors such as Atlantic SSTs and European precipitation, the later as a proxy for soil moisture, a known factor in strengthening land–atmosphere feedback processes, are also important. The strength of the relationship between summer SLP anomalies and heat waves is improved (from 35%) to account for around 46% of its variability when summer Atlantic and Mediterranean SSTs and summer European precipitation anomalies are included as predictors. This indicates that these predictors are not completely collinear rather that they each have some contribution to accounting for summer heat wave variability. However, the simplicity and scale of the statistical analysis masks this complex interaction between variables. There is some useful predictive skill of summer heat waves using multiple lagged predictors. A CCA using preceding winter North Atlantic SSTs and preceding January to May Mediterranean total precipitation results in significant hindcast (1972–2003) Spearman rank correlation skill scores up to 0.55 with an average skill score over the domain equal to 0.28 ± 0.28. 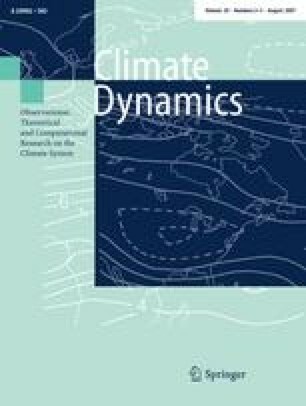 In agreement with previous studies focused on mean summer temperature, there appears to be some predictability of heat wave events on the decadal scale from the Atlantic Multidecadal Oscillation (AMO), although the long-term global mean temperature is also well related to western European heat waves. Combining these results with the observed positive trends in summer continental European SLP, North Atlantic SSTs and indications of a decline in European summer precipitation then possibly these long-term changes are also related to increased heat wave occurrence and it is important that the physical processes controlling these changes be more fully understood.